Abstract: The SL-85DR2 is based on the Intel i845E chipset and has support for any Pentium 4 on the Socket m478 form factor (400MHz and 533MHz FSB). It seems that style and looks are starting to play a larger role in computer peripherals these days and the Soltek SL-85DR2 is no exception. 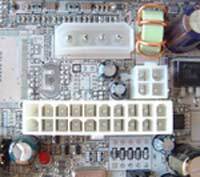 Using the very cool looking Silver PCB (like the ones found on the Triplex videocards), Soltek is bound to catch a few eye's with their SL-85DR2 motherboard. The SL-85DR2 is based on the Intel i845E chipset and has support for any Pentium 4 on the Socket m478 form factor (400MHz and 533MHz FSB). The Sl-85DR2 is Soltek's no frills model, other then onboard audio (AC-97 codec) there are no other goodies. There are only two DIMM slots, but that's not really a bad thing since the i845E chipset only supports four banks of memory. 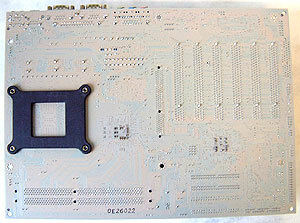 i845E based boards with more three or four DIMM slots all have the same limitation. We're always big fans of upgradeability and Soltek allows for that with the SL-85DR2. 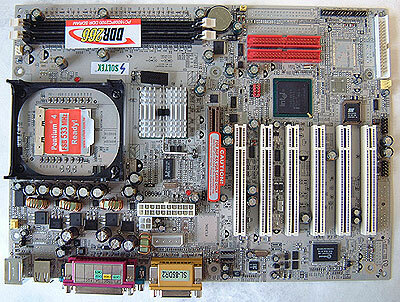 With six 32bit PCI slots you shouldn't ever run out of PCI slots. The SL-85DR2 has a 4x AGP slot with a 1.5V lock, we were a bit surprised that the board didn't have the usual AGP lock to keep the videocard secure. Finally, with the ICH4 southbridge comes USB 2.0. The ports are inthe usual location just below the PS/2 ports. There are two more USB headers at the bottom of the board but Soltek only comes bundle with one USB bracket. Since Intel doesn't believe in supporting the Ultra/133 IDE standard, Ultra/100 is the fastest the ICH4 will go. Not a big deal though, the performance between Ultra/133 and Ultra/100 is very little unless you're benchmarking. We never like having to drape the power cables over the CPU fan but at least all the power connectors are in the same location behind the Audio jacks. Another quirk we found was because the P4 connector was very close to the main ATX power connector and it was difficult to plug one in if the other was already populated. For overclockers and enthusiasts there are a ton of jumpers on the motherboard. AGP voltage, DIMM voltages, FSB selection, etc. It would have been nice for Soltek to integrate everything into the BIOS since it's easier to manipulate things there. Because of the relative small sized PCB, Soltek had to put the IDE ports just under the DIMM slots and the floppy drive connector could give problems to people with full tower cases like the Inwin Q500. If you have longer length PCI cards you can only use them in slots 1, 5 and 6. On a side note, the test sample's floppy drive connector seems to be defective. It would keep giving me Floppy drive errors, changing the cable or floppy drive didn't help.